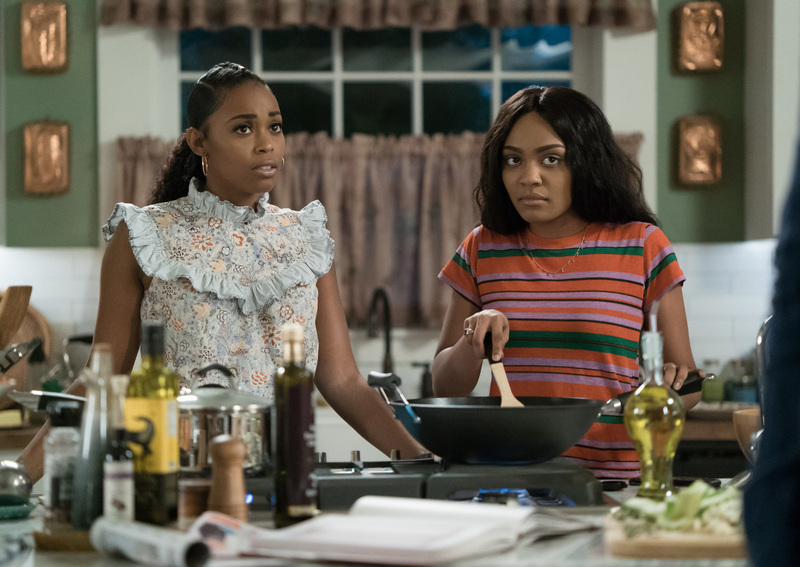 “The Book of Consequences: Chapter Two: Black Jesus Blues” is the full title for the second episode of Black Lightning Season 2 airing October 16 on The CW, and we now have some preview images… including some shots of Anissa with a woman who is most definitely not Grace! Grace does show up in the photos, though…. and in our recent visit to the Black Lightning sets, Nafessa did confirm that Grace is still around. STRUGGLES – Jefferson (Cress Williams) must break the news to his students and faculty that he is stepping down. Struggling with his new life as Painkiller, Khalil (Jordan Calloway) pays a visit to Jennifer (China Anne McClain) in hopes of mending things. Meanwhile, Tobias (Marvin Jones III) continues to enact his plan. Nafessa Williams, Christine Adams, Damon Gupton, and James Remar also star. Oz Scott directed the episode written by Charles D. Holland (#202). Original airdate 10/16/2018. The photos and a trailer for “Black Jesus Blues” can be found below.